Corneal blindness is the second most important cause of uniocular blindness after cataract. To combat corneal blindness, Biratnagar Cornea Collection Centre was started on 16th November 2007 in co-operation with Nepal Eye Bank (Tilganga Eye Centre) and NNJS-C. 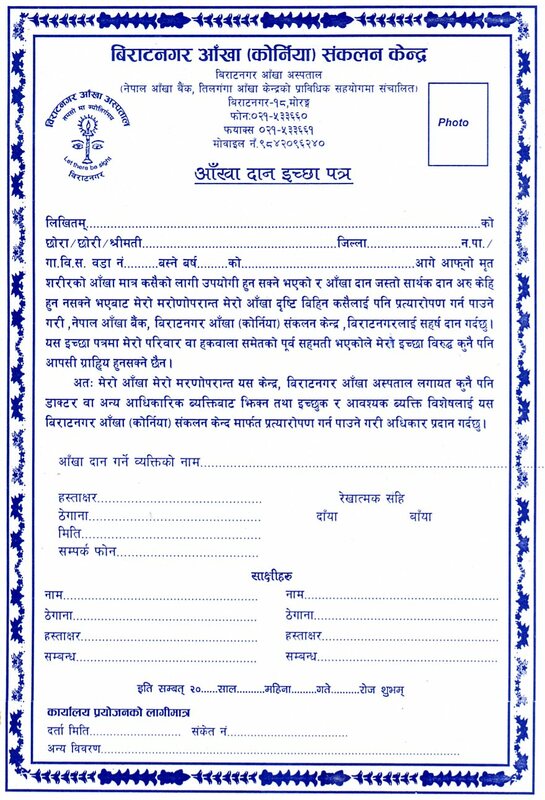 The centre provides eye donation willingness forms. To increase public awareness about eye donation and to collect healthy donor corneas. Workshops with different social and religious groups about eye donation. Classes (Power point presentation and video shows) about eye donation with different groups. Radio advertisements about eye donation. Pamphlets distribution and display of posters. Radio interviews with different FM radio stations (Koshi FM, Image FM, Purwanchal FM) about eye donation activities. Download our Power Point presentations in Nepali and English.